MINSK (BelTA) – All the necessary documents have been prepared to set up a company producing Belarusian tractors in the south of Tajikistan, Ambassador Extraordinary and Plenipotentiary of Tajikistan to Belarus Kozidavlat Koimdodov told a press conference on 7 September. 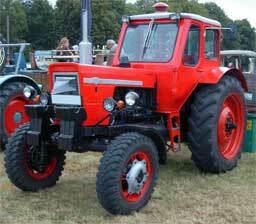 Belarus is a series of four-wheeled tractors produced since 1950 at the Minsk Tractor Plant, MTZ in Minsk, Belarus. These tractors were very famous throughout the former Soviet Union, and have been exported to the Eastern Bloc, as well as other countries including United States. According to the diplomat, the new facility will produce 250 tractors per year. By 2017 the company’s capacity will be increased up to 1,500. There are plans to export some of tractors produced in Tajikistan to other countries of the region. The production site has already been chosen. “There are some technicalities that depend on the partial financing by Tajikistan. The sum is small – not more than US $5 million. I think the project will be launched in the near term,” the diplomat informed. He added that negotiations are underway to supply products made by BelAZ, MAZ and MTZ to Tajikistan. In recent times Belarus has supplied about 1,000 heavy-duty, construction and quarry machines to Tajikistan to build power engineering installations. The machines are mostly used at the Rogun Dam. Tajikistan is holding talks with BelAZ on opening a service centre near the Rogun Dam. According to the diplomat, Tajikistan has already received over half of 1,140 machines it planned to purchase. The parties are expanding cooperation in agriculture as well. Contracts have been signed between cattle and seed breeding companies of the two states. The overall trade and economic cooperation between the two countries is making some progress. Over the last five years, the bilateral trade rose almost three times. In H1 2012, it was estimated at US $44 million, of which $40 million is Belarusian export to Tajikistan.